Based on the novel "Papa to Musume no Nanokakan" by Takahisa Igarashi (published October, 2006 by The Asahi Shimbun Company). Do-Yeon (Jung So-Min) is a high school student. 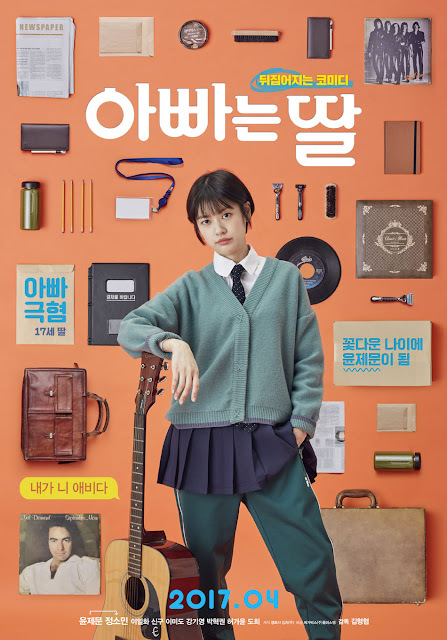 She doesn't have a good relationship with her father (Yoon Je-Moon) who is constantly nagging to her to study. Do-Yeon’s dream is to go on a date and her first date is approaching. Meanwhile, Do-Yeon’s father has worked as a chief section for years and never had a promotion. His chance for a promotion is finally approaching. Both father and daughter have important moments arriving, but they suddenly change bodies. Hiroshi Tachi in the lead roles. Story for “Dad is Daughter” follows daughter (Jung So-Min) and father (Yoon Je-Moon) as they both have important moments approaching … but they suddenly switch bodies. “Dad is Daughter” opens April, 2017 in South Korea.